Sinn Féin Senator Pearse Doherty has secured a debate in the Seanad on the need for the Minister for Enterprise, Trade and innovation to make towns in Donegal South West a priority for future IDA investment. 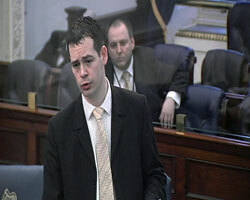 Doherty has called for a comprehensive strategy from the IDA to promote Donegal. “Of the 987 IDA supported companies in the state only 2 of these are in Donegal South West and indeed during Mary Coughlan’s tenure as Minister for Enterprise, Trade and Employment, not a single visit was made by the IDA to Donegal South West,” Doherty said. “In a county where there are almost 21,000 people out of work, this kind of lack-lustre attitude to job creation is simply not good enough.